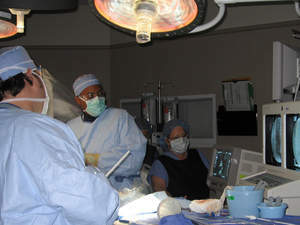 BIRMINGHAM, AL -- (MARKET WIRE) -- August 23, 2005 -- At noon CDT (1 p.m., EDT)(1700 UTC) on Aug. 23, surgeons at UAB Hospital at the University of Alabama at Birmingham will perform a recently approved procedure in a new, state-of-the-art endovascular operating room in a live webcast on OR-Live.com. The procedure, called a thoracic aortic endograft, was introduced to reinforce the aorta in the thoracic cavity. It is used on patients suffering from a degeneration of the aorta, a condition in which the aorta dilates, becomes weak-walled and develops a risk of rupture. It is performed on about 15,000 patients across the nation annually. The benefits for patients include smaller incisions, less stress on the heart and lungs and less risk of a spinal stroke. Patients also have a shorter recovery. The procedure will be done in UAB Hospital's new endovascular operating suite. It has been outfitted with digital fluoroscopic imaging equipment that allows surgeons to perform both the traditional open surgery and minimally invasive endovascular procedures. Dr. William D. Jordan Jr., professor and chief of vascular surgery at the UAB School of Medicine, helped design the new suite. "The need for enhanced revascularization techniques is increasing along with an expanding elderly population," Dr. Jordan said. "An estimated 20 percent of people older than age 70 have lower extremity vascular disease, and 50 percent of these cases are symptomatic, characterized by severe leg pain when walking. The elderly also suffer high rates of cerebrovascular disease. As Alabama's population ages along with the rest of the nation, the prevalence of vascular disease and stroke continues to grow." See a live Webcast of a recently approved minimally invasive<br> Thoracic Aortic Endograft on a patient suffering from a <br>thoracic aneurysm. Visit OR-Live.com now to view <br>Dr. Jordan's comments about this new procedure.